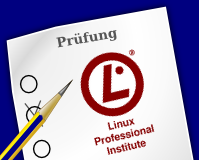 The Linux Professional Insitute - LPI has made the develompent of international qualification standards for Linux and free software to their business. The aim is the support and encouragement of a professional handling with this kind of software. * The first price is true for Univention partners. The language will be chosen on registration. The costs do not include the admission fee for the Chemnitzer Linux-Tage. The exams will take place on Sunday, 15 March 2009, at 10:30am and 12:30pm in the room VR. The exam will be conducted on paper. The result will arrive via email after the manual correction in about four weeks after the exam. With the completed certification level, the official documents will be delivered by post. The participants of the exam will need a valid LPI-ID and a piece of information with a photo (ID card). Those who don't yet have a LPI-ID, have the opportunity to create one on registration at https://www.lpi.org/caf/Xamman/register. As a reminder: In order to become LPI Level 1 certified (LPIC-1), you will have to pass the exams 101 and 102. For the second level (LPIC-2) you will additionally need the exams 201 and 202. Thus with the pass of one sole exam, you will not obtain a certification. Due to the limited amount of available slots for the LPI exam, it is necessary to register. The registration form is available at http://lpievent.lpice.eu (already closed). For further information, please directly talk to the LPI e.V. or visit LPI international,LPI Central Europe and LPI e.V.